One of our favorite ways to interact with our community on Twitter is through our weekly #CMWorld Twitter Chat. The chat started in 2013 with a 10-week experiment prior to Content Marketing World as a way to connect our speakers with potential and registered attendees. After that event, we received many requests from the #CMWorld Twitter community to continue the chats. Fast forward to today, and we have hosted almost 130 chats and have learned a lot along the way. If you are considering starting a Twitter Chat as part of your content marketing efforts or improving your existing chat, read on to get a detailed look inside our process as well as some lessons learned. Like anything you do, you need to consider why you want to invest the time in a Twitter chat and how it will support your other marketing efforts. Asked another way: How will your Twitter chat provide a better experience for your customers? PRO TIP: Plan your chats in batches to save time. We typically brainstorm topics and ideas every eight to 12 weeks and do a lot of outreach at once. Similarly, we also write the questions and the introductions to the blog posts in bulk. It’s been a significant time-saver. We have a tab in which we brainstorm our guest and topic ideas. As mentioned, we have several goals for our chats, and every guest and topic serves those purposes. Sometimes we identify guests (e.g., CMWorld/ICC speakers and influencers in the industry) and other times we identify topics (e.g., what kinds of questions are we getting asked a lot?). PRO TIP: As we have learned the hard way, not all topics are digestible in 140 characters. When planning topics, consider how the Twitter community will be able to interact. The next tab on our spreadsheet tracks our detailed schedule, not only detailed plans for upcoming chats but historical data about each chat so we can understand which topics and guests are the best fit for our audience. Once the topic and speaker are set, our next step is to develop questions. Michele and I take turns writing chat questions, and the other person proofs and edits. PRO TIP: After writing questions for 100-plus chats, we have learned that it helps to get multiple perspectives so the questions – and answers – don’t sound the same. Try to share the load with someone who has different expertise than you. And, while I recommend crafting the questions to save your guests’ time, don’t rule out asking them for insights. We have a separate tab where we store all of the previously asked questions. It’s a simple list to keep and a handy reference. Our goal is to take the guesswork out of the hour while making the chat as fun and engaging as possible for the guest. 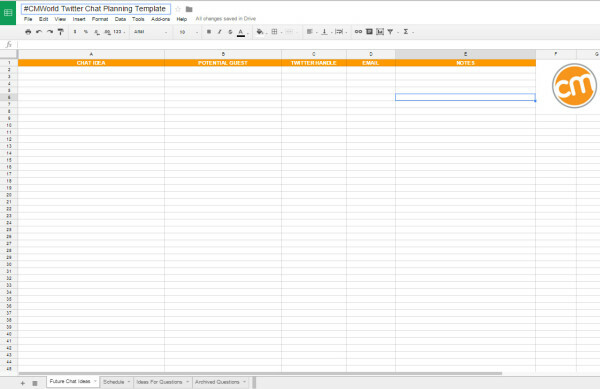 PRO TIP: You can download and customize the template we send to our guests. In addition to reaching out to the guest, we also share the details with our community via a Facebook event page, which is set up for each chat. Our community members can see if a chat applies to their informational needs. Participation and responses have been more robust because attendees can think about their answers in advance. New chat participants find us through organic reach on Facebook. Each week, we use Hashtracking to record our Twitter chats. Not only does this report provide a transcript of the hour’s tweets but it also offers specific details, such as top contributors and most retweeted tweets, which help us make note of hot topics or potential questions to be used for future CMI blog posts or Twitter chats. With a list averaging 200-plus chat participants with whom the guests can easily engage from Hashtracking, our guests now have an instant and active community they can tap into for their own content plans. 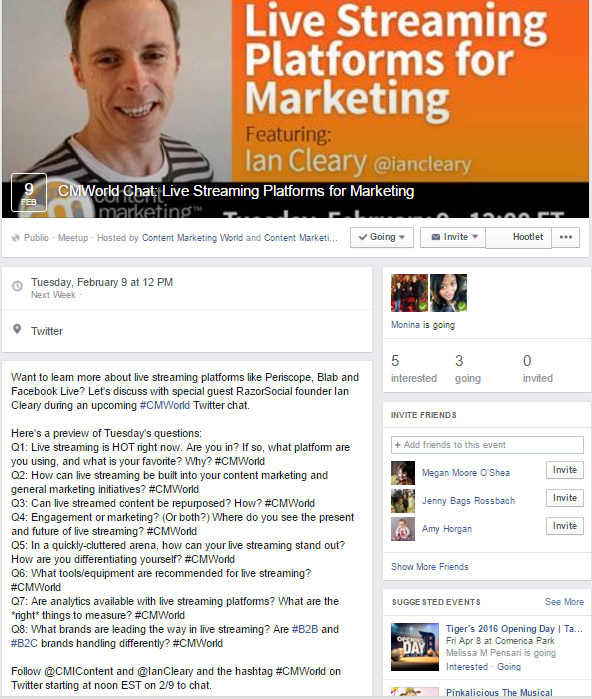 To keep the chat on schedule, tweets are prescheduled using TweetDeck or Buffer. It helps us stay on track in each hour session and gives our community manager the ability to welcome and engage with our audience without watching the clock. During the chats, we use Nurph or TweetDeck, but we’re also fans of tchat.io and Hootsuite. Our chat participants also use other methods, but as long as we’re all following the CMWorld hashtag, we’re seeing the same information. Find a tool that you’re most comfortable with – that’s the most important part. Our questions are asked in roughly six-minute increments, allowing ample time for our participants to respond and engage. With eight questions spaced at five to six minutes apart, a few minutes are available in the beginning for introductions, fun banter, and catching up — and 10 minutes at the end for a participant-guest Q&A. PRO TIP: Our chat originally included 10 questions, but we changed the format to eight questions with a Q&A with the guest at the end. This format works well because our community members like to have the opportunity to ask their own questions that arise over the course of the hour. Once the chat is over, we use a virtual assistant to create a transcript from the tweets in the Hashtracking report. The transcripts are shared with the team in a Dropbox folder, and several things occur. PRO TIP: To filter spam tweets from your Hashtracking report, refine your search within the transcript by limiting terms and Twitter handles using Boolean operators. She logs those findings in a spreadsheet she uses to curate into other content. You can read more about CMI’s reuse strategy (and get another handy template). Of course, she also looks for key ideas we may want to cover in future content plans. 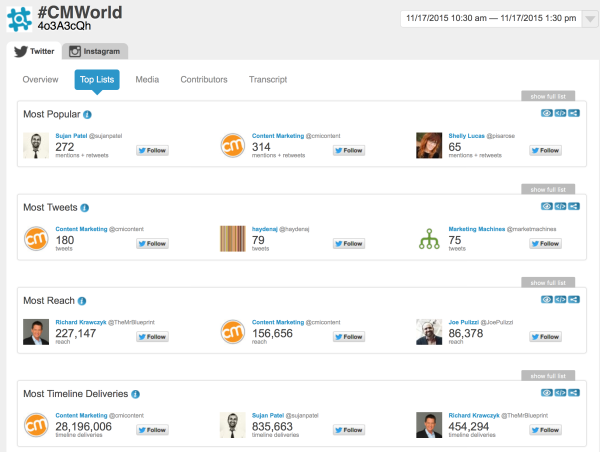 Each transcript is published on our CMWorld blog and our Twitter chat page. Not only are these transcripts a great reference for those who want to review the session, but they also provide some search benefits for our Content Marketing World website. Also included on the Twitter chat blog posts are Storify links for each chat and the most popular tweet from that week. 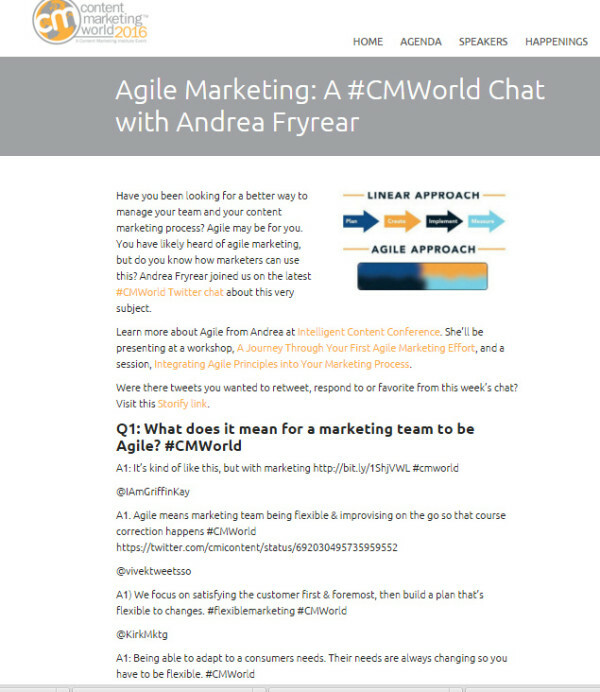 Here is one transcript example from Andrea Fryrear’s #CMWorld Twitter chat on Agile content marketing. Our Twitter chats also provide a seemingly endless stream of editorial ideas, some of which we translate into posts on the CMI blog that can take multiple forms. For instance, during a chat about small business content marketing, one participant expressed interest in the ways Google Trends could be used for content. Arnie Kuenn followed up with a blog post on using Google Trends to punch up content creation. We also have had guests answer the questions from their chats in longer form. One such example is a post from Meghan Casey in which she answered questions from her chat on content strategy basics for marketers. Then, we provide a wrap-up of our favorite tweets from the chats at the end of the year to give our community some extra love. Through Google Analytics, we know that our Twitter referral traffic is up 20% year-over-year. Additionally, we see a 54% increase in Twitter followers. While we can’t attribute all of the new followers to our Twitter chats, we know noon to 1 p.m. ET Tuesdays is our most popular hour on Twitter. While the total number of tweets, number of participants, and reach are important, what is even more interesting is that we can see what days and times on Twitter are getting the most referrals and conversions, which we can trace back to chat topics that day. And, as an added bonus, the chats have made our in-person interactions much more enjoyable (especially for the introverts out there). It’s fun to identify and chat with people you first knew from Twitter. We hope you will join us on a #CMWorld Twitter chat soon. 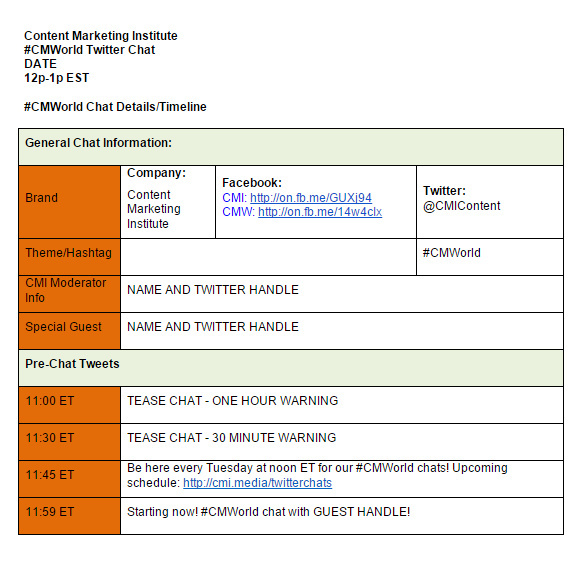 We hold chats on Tuesdays at noon Eastern (U.S.) – follow the #cmworld hashtag and find us at @CMIContent. Are you interested in being a special guest? Do you have a great topic idea or any questions? Submit ideas in the comments. Check out the speaker lineup or catch up on past chats on our Twitter chat page. Follow our Twitter chats virtually and get pumped for the real life meet-up at Content Marketing World 2016. Register today and use code BLOG100 to save $100 off of the main event and all-access passes. 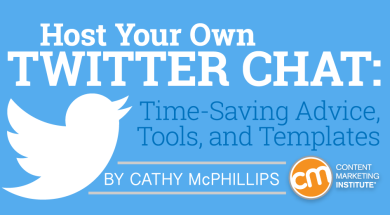 The post Host Your Own Twitter Chat: Time-Saving Advice, Tools, and Templates appeared first on Content Marketing Institute.